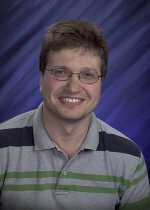 Dr. Alexandre Tartakovsky is a scientist in the Computational Science and Mathematics Division at the Pacific Northwest National Laboratory. The main focus of Tartakovsky's research is the theoretical and computational aspects of the modeling of flow and reactive transport in porous and fractured media under both saturated and unsaturated conditions. In Tartakovsky's research in the subsurface flow and transport phenomena, he pursues a multi-disciplinary approach and relies on methods and techniques used in hydrology, mathematics, computational physics, and chemical engineering. Hagge T.J., P. Stinis, E.H. Yeung, and A.M. Tartakovsky. 2017. "Solving differential equations with unknown constitutive relations as recurrent neural networks." In Deep Learning for the Physical Sciences (NIPS Workshop), December 8, 2017, Long Beach, California. La Jolla, California:Neural Information Processing Systems Foundation, Inc. PNNL-SA-130320. Engel D.W., K.D. Jarman, Z. Xu, B. Zheng, A.M. Tartakovsky, X. Yang, and R. Tipireddy, et al. 2015. UQ Methods for HPDA and Cybersecurity Models, Data, and Use Cases. PNNL-24901. Richland, WA: Pacific Northwest National Laboratory. Scheibe T.D., X. Yang, K.L. Schuchardt, K. Agarwal, J.M. Chase, B.J. Palmer, and A.M. Tartakovsky. 2014. "A Many-Task Parallel Approach for Multiscale Simulations of Subsurface Flow and Reactive Transport." In 7th Workshop on Many-Task Computing on Clouds, Grids, and Supercomputers (MTAGS 2014), November 16, 2014, New Orleans, Louisiana. New York, New York:ACM. PNNL-SA-105263. Wang P., D.M. Tartakovsky, and A.M. Tartakovsky. 2013. "Stochastic Forecasting of Algae Blooms in Lakes." In Modelling and Simulation in Fluid Dynamics in Porous Media. Springer Proceedings in Mathematics & Statistics, edited by JA Ferreira, et al. 99-108. New York, New York:Springer. PNNL-SA-92718. Kordilla J., T. Geyer, and A.M. Tartakovsky. 2012. "Simulation of film and droplet flow on wide aperture fractures using Smoothed Particle Hydrodynamics." In Proceedings of the 7th International SPHERIC Workshop, May 29-31, 2012, Prato, Italy, 31-37. Victoria:Monash University. PNNL-SA-91509. Pan W., A.M. Tartakovsky, and J.J. Monaghan. 2012. "A Smoothed Particle Hydrodynamics Model for Ice Sheet and Ice Shelf Dynamics." Journal of Glaciology 58, no. 207:216-222. PNNL-SA-80307. Tartakovsky A.M., W. Pan, and J.J. Monaghan. 2012. "SPH non-Newtonian Model for Ice Sheet and Ice Shelf Dynamics." In Proceedings of the 7th International SPHERIC Workshop, May 29-31, 2012, Prato, Italy, 23-30. Victoria:Monash University. PNNL-SA-87702. Adami S., X.Y. Hu, N.A. Adams, E.M. Ryan, and A.M. Tartakovsky. 2011. "A fully coupled 3D transport model in SPH for multi-species reaction-diffusion systems." In Proceedings of the 6th international SPHERIC Workshop, June 8-10, 2011, Hamburg, Germany, edited by T Rung and C Ulrich, 187-193. Hamburg:Schriftenreihe Schiffbau. PNNL-SA-80146. Kordilla J., T. Geyer, and A.M. Tartakovsky. 2011. "Simulation of gravity driven free-surface flow in fractured geological media." In Proceedings of the 6th international SPHERIC workshop, June 8-10, 2011, Hamburg, Germany, edited by T Rung and C Ulrich, 153-158. Hamburg:Schriftenreihe Schiffbau. PNNL-SA-80224. Scheibe T.D., A.M. Tartakovsky, U.C. Bandara, B.J. Palmer, M. Oostrom, C. Zhang, and A. Bonneville. 2011. "Physical and Numerical Models of Pore-Scale Trapping of CO2." In Les Rencontres Scientifiques d’IFP Energies Nouvelles: International Conference on Flows and Mechanics in Natural Porous Media from Pore to Field Scale - Pore2Field, November 16-18, 2011, Rueil-Malmaison, France. Paris:IFP Energies Nouvelles. PNNL-SA-83932. Tartakovsky A.M., and T.D. Scheibe. 2011. "Dimension reduction method for SPH equations." In Proceedings of the 6th international SPHERIC Workshop, June 8-10, 2011, Hamburg, Germany, edited by T Rund and C Ulrich, 22-29. Hamburg:Schriftenreihe Schiffbau. PNNL-SA-80227. Scheibe T.D., B.J. Palmer, K.L. Schuchardt, Y. Fang, and A.M. Tartakovsky. 2010. "Simulations of Subsurface Flow and Transport at the Pore and Continuum Scales." In SciDAC 2010 Scientific Discovery Through Advanced Computing, July 11-15, 2010, Chattanooga, Tennessee. Washington Dc:US Department of Energy, Office of Science. PNNL-SA-74118. Tartakovsky A.M. 2010. "Langevin Model for Reactive Transport in Porous Media." Physical Review. E, Statistical Physics, Plasmas, Fluids, and Related Interdisciplinary Topics 82, no. 2 PT 2:Art. No. 026302. PNNL-SA-67811. Battiato I., D.M. Tartakovsky, A.M. Tartakovsky, and T.D. Scheibe. 2009. "On breakdown of macroscopic models of mixing-controlled heterogeneous reactions in porous media." Advances in Water Resources 32, no. 11:1664-1673. PNNL-SA-64544. Gouet-Kaplan M., A.M. Tartakovsky, and B. Berkowitz. 2009. "Simulation of the interplay between resident and infiltrating water in partially saturated porous media." Water Resources Research 45. PNNL-SA-62090. Lin G., and A.M. Tartakovsky. 2009. "An efficient, high-order probabilistic collocation method on sparse grids for three-dimensional flow and solute transport in randomly heterogeneous porous media." Advances in Water Resources 32, no. 5 SP ISS:712-722. PNNL-SA-58642. Ryan E.M., A.M. Tartakovsky, and C. Amon. 2009. "A Smoothed Particle Hydrodynamics Model of Competitive Adsorption in Porous Media." In 33rd International Association of Hydraulic Engineering & Research (IAHR) Congress: Water Engineering for a Sustainable Environment, August 9-14, 2009, Vancouver, Canada, 1, 179-186. Madrid:International Association of Hydraulic Engineering & Research. PNNL-SA-65856. Sun X., A.M. Tartakovsky, and M.A. Khaleel. 2009. "Probabilistic Based Design Methodology for Solid Oxide Fuel Cell Stacks." Journal of Fuel Cell Science and Technology 6, no. 2:Art. No. 021004. PNNL-SA-55461. Tartakovsky A.M., G.D. Tartakovsky, and T.D. Scheibe. 2009. "EFFECTS OF INCOMPLETE MIXING ON MULTICOMPONENT REACTIVE TRANSPORT." Advances in Water Resources 32, no. 11:1674-1679. PNNL-SA-65914. Tartakovsky A.M., P. Meakin, and A.L. Ward. 2009. "Smoothed particle hydrodynamics model of non-aqueous phase liquid flow and dissolution." Transport in Porous Media 76, no. 1:11-34. PNNL-SA-51466. Tartakovsky A.M., T.D. Scheibe, and P. Meakin. 2009. "PORE-SCALE MODEL FOR REACTIVE TRANSPORT AND BIOMASS GROWTH." Journal of Porous Media 12, no. 5:417-434. PNNL-SA-57286. Xu Z., P. Meakin, and A.M. Tartakovsky. 2009. "Diffuse-interface model for smoothed particle hydrodynamics." Physical Review. E, Statistical Physics, Plasmas, Fluids, and Related Interdisciplinary Topics 79, no. 3:Art. No. 036702. PNNL-SA-64528. Tartakovsky A.M., D.M. Tartakovsky, and P. Meakin. 2008. "Smoothed Particle Hydrodynamics Stochastic Model for Flow and Transport in Porous Media." In ERCOFTAC SIG SPHERIC III International Workshop Proceedings, June 4-6, 2008, Lausanne, Switzerland, edited by P Maruzewski, 1-5. Lausanne:EPFL. PNNL-SA-62173. Tartakovsky A.M., P. Meakin, and A.L. Ward. 2007. "Smoothed Particle Hydrodynamics model for multiphase flow in porous media." In Proceedings of the Second Workshop on Smoothed Particle Hydrodynamics European Research Interest Community (SPHERIC), May 23-25, 2007, Madrid, Spain, edited by AJC Crespo, 135. San Cipri�n De Vi�as:Aica. PNNL-SA-55223. Tartakovsky A.M., P. Meakin, and T.D. Scheibe. 2007. "Reactive transport and biomass growth in porous media." In Proceedings of the Second Workshop on Smoothed Particle Hydrodynamics European Research Interest Community (SPHERIC), May 23-25, 2007, Madrid, Spain, edited by AJC Crespo, et al, 139. San Cipri�n De Vi�as:Aica. PNNL-SA-55222. Tartakovsky A.M., P. Meakin, T.D. Scheibe, and R.M. Eichler West. 2007. "Simulations of reactive transport and precipitation with smoothed particle hydrodynamics." Journal of Computational Physics 222, no. 2:654-672. PNNL-SA-46816. Tartakovsky A.M. 2006. "Langangian Particle Model of Friction Stir Welding." In 6th International Symposium on Friction Stir Welding, October 10-13, 2006, Saint Sauveur, Canada, 1. Cambridge:TWI Ltd. PNNL-SA-52321. Tartakovsky A.M., and P. Meakin. 2006. "Pore-scale modeling of immiscible and miscible fluid flows using smoothed particle hydrodynamics." Advances in Water Resources 29(10). PNNL-SA-44208. Tartakovsky A.M., T.D. Scheibe, G. Redden, P. Meakin, and Y. Fang. 2006. "Smoothed Particle Hydrodynamics Model for Reactive Transport and Mineral Precipitation." In CMWR XVI - International Conference on Computational Methods in Water Resources. Copenhagen, Denmark, June 18-22, 2006, 8 pages. Copenhagen:Technical University of Denmark (DTU). PNNL-SA-51850. Tartakovsky A.M., and P. Meakin. 2005. "A smoothed particle hydrodynamics model for miscible flow in three-dimensional fractures and the two-dimensional Rayleigh-Taylor instability." Journal of Computational Physics 207, no. 2:610-624. PNNL-SA-44137. Tartakovsky A.M., and P. Meakin. 2005. "Modeling of surface tension and contact angles with smoothed particle hydrodynamics." Physical Review. E, Statistical Physics, Plasmas, Fluids, and Related Interdisciplinary Topics 72, no. 2:026301-1 - 026301-9. PNNL-SA-44797. Tartakovsky A.M., and P. Meakin. 2005. "Simulation of unsaturated flow in complex fractures using smoothed particle hydrodynamics." Vadose Zone Journal 4, no. 3:848-855. PNNL-SA-44311. Tartakovsky A.M., P. Meakin, and H. Huang. 2004. "Stochastic analysis of immiscible displacement of the fluids with arbitrary viscosities and its dependence on support scale of hydrological data." Advances in Water Resources 27, no. 12:1151-1166. PNNL-SA-44141.